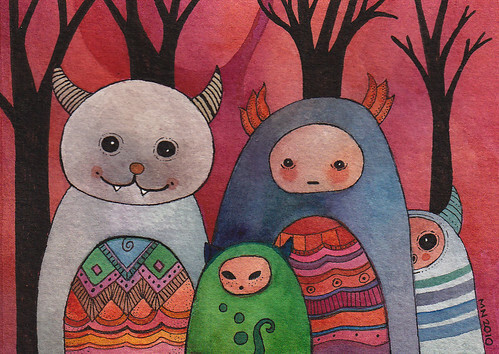 Monster family, a photo by megan_n_smith_99 on Flickr. IMG_1792, a photo by megan_n_smith_99 on Flickr. this is dangermouse. he was my cat for a while, and then he went to live with some friends of mine. they took this photo. i actually stole dangermouse from someone who threw him off a 2nd story balcony. when i got him he was completely flea infested and had worms. i took him to the vet and we got him all fixed up. unfortunately he just drove me crazy in my small condo, jumping on my head at 4 AM. also he could open all the doors and cupboard doors. so he went to live with friends until i found him another home but they got attached to him and wanted to keep him, so he stayed. he was a very large cat - 18 pounds and simply huge. he had an enormous amount of character. anyhow! there is a point to this. this is my favorite picture of dangermouse. his family was carving pumpkins and here is dangermouse trying to help. 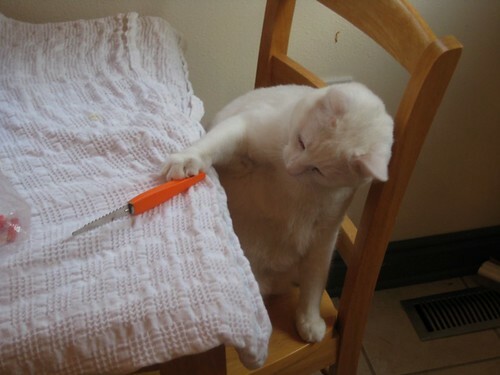 i can just see his little brain whirring, "how can i pick up this pumpkin carving knife? i know, leverage!" dangermouse died a couple years ago and is missed. happy halloween eve to you dangermouse, where ever you are. Autumn Leaves, a photo by megan_n_smith_99 on Flickr. well, i got some good painting in yesterday! i am really happy how the latest two came out - this is one and if you click the picture you can go to flickr and see the other. i am working on some others. we'll see how much art time i get this week - not much i think. today i hope to get some art time later today but am also trying to get ahead on chores and cooking and things because i expect to be working very long days next week and i want to make it was easy on myself as i can! i am thinking of making a big pot of potato soup and some pumpkin bread. i am working a temp job in downtown seattle. i like working downtown for the most part, though i wish there was someplace quiet to go at lunch! i used to often go to a park near my old job, but in downtown the parks are crowded and noisy and if you sit down on the ground you will be told you can't do that, you can only sit on benches. and i am sure if i lay on a bench like i did at my old part it would NOT go over well. of course there are a lot more police and security guards down in the area now because i work across the street from westlake park, which is where occupy seattle has been situated. but last night they moved their base camp to a community college, about a mile away. they still plan to be in westlake park during the day, though. 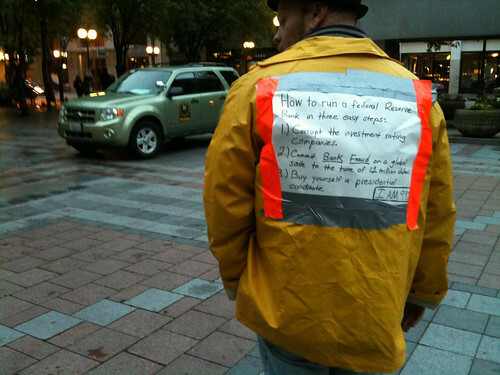 i have to say anyone willing to camp out in the often miserable seattle weather is pretty dedicated to their cause. and most nights they have not had tents. so anyway while working downtown is interesting and i appreciate the proximity to various food and coffee options, i actually hate my job. i started out liking it ok and probably still would if i could work 40--45 hours max a week, but that's not going to be the case starting monday. so i really can't wait for the job to be over - i am hoping it will be at the end of november. i am probably going to eat lunch out more just to get out of the office and sit somewhere quiet. the top floor of the building connected to mine has a good court and lots of light - mostly grey light but never the less, light! i have found i can get some nice fried rice or pad see ewe for about $7--$8 and it's gluten free and enough for 2 days of lunch! now if i could just get over this cold! 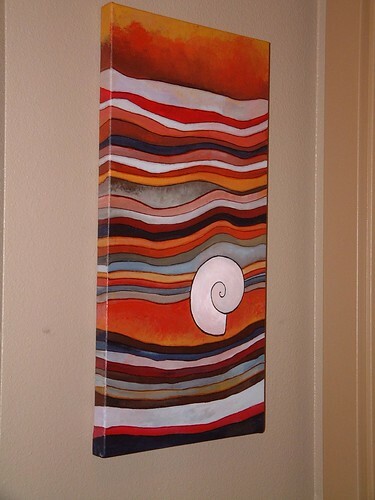 Don't forget - you still have a couple more weeks to see my Strata Paintings at Stuff What I Like in Everett Washington. At SWIL every meal is an adventure! Read about them here in the Everett News. Little Spook, a photo by megan_n_smith_99 on Flickr. 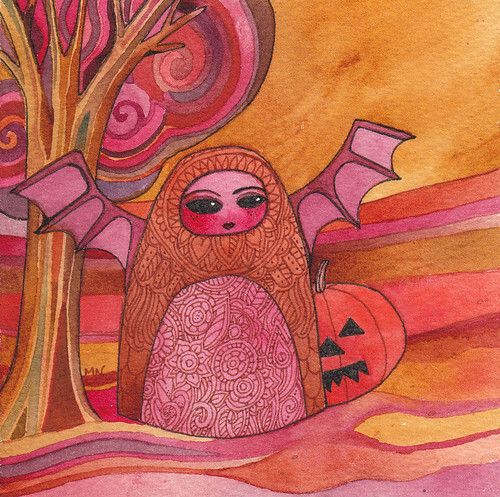 my little halloween paintings are on sale in my etsy shop! (they are on page 2) happy haunting! Leaf Song, a photo by megan_n_smith_99 on Flickr. Ugh. 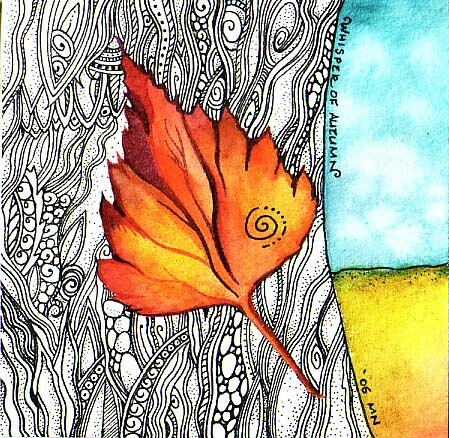 I wish I felt as light and free as this leaf, but I did paint it Saturday, so I must have felt better then! I am sick. lots of colds going around and this is a bad one. I even got my flu shot but of course that does not protect you from everything! Lots of people at work have been sick and I suspect I picked it up there. But we were told no more sick time so I may not be able to go back to my job. We'll see. I think I will make toast and tea, I think I forgot to eat breakfast and lunch today, though I've napped a bit! This little painting is available in my Etsy Shop and there are still some little Halloween spooks who needs good homes too. the start of ... something, a photo by megan_n_smith_99 on Flickr. This is how I get started. 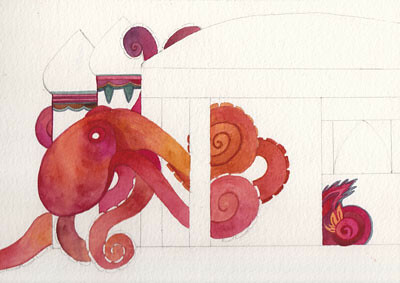 Well, sometimes I go more free-form but for this one I knew I wanted a giant octopus (Kraken) and a temple inspired by traditional mosques, so I penciled things in a bit. from here on out things will be more spontaneous! Spontaneous is the way I like things. I am always surprised - usually pleasantly. Trick or Treat, a photo by megan_n_smith_99 on Flickr. 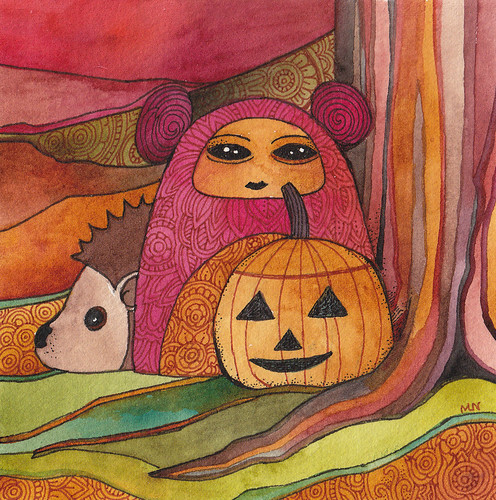 October is winding down but I still have some halloween art in my Etsy Shop. I am so tired this evening that I am going to Let Annie Dillard provide the substance for you. I just finished reading Pilgrim at Tinker Creek which is amazing, though some readers might lose patience with it because in some ways nothing ever happens - and in other ways everything happens. the whole world. Arabesque, a photo by megan_n_smith_99 on Flickr. This is my latest painting. I really liked the way the flowers came out and will probably experiment some more with that color scheme. These days I have much less time for painting and the ideas are coming faster than I can paint. We'll see what makes it out on paper, in the end. It's good to have work of course but I actually have less time now than I did before I got laid off in March - The hours of this job are a little longer and the commute takes more time. I am trying to take the mental shift necessary to go from having been part of a team for 15 years with people I knew well and cared about to being ... a temp. There is just something about that word that sort of sums it up. I am also trying to make the shift to a different future than what I had imagined. I don't know if I will be able to keep my condo and stay in this neighborhood that I love. I've never been very good at taking things one day at a time but I am going to have to try! I have some other things on my mind that I may or may not blog about in days to come. 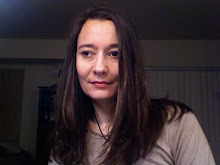 My sister seems to manage to blog about more personal things than I manage to. 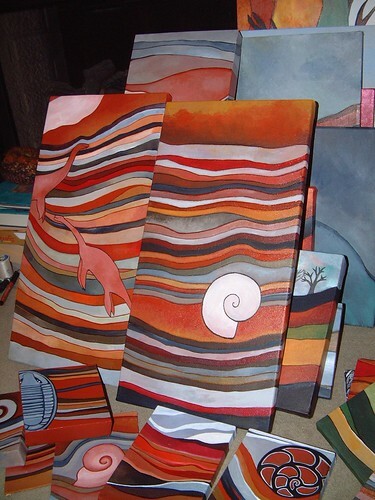 This blog is really supposed to be about my art - at least that was my vision when I started it. Is that why you read it? Good food and good company! Check out my review here. 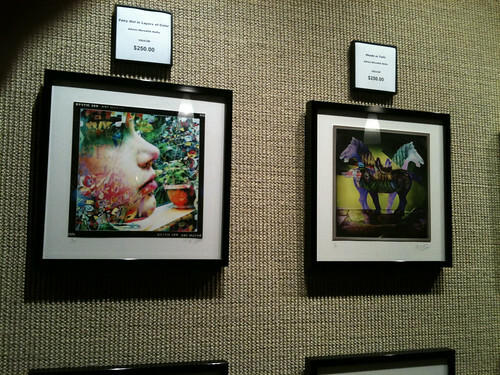 The show is up until Nov 13th - if you are in the area you should check it out! And be sure to save some room for dessert - the chocolate rice was awesome and the desssert lumpia sounds really good too! Autumn Heron, a photo by megan_n_smith_99 on Flickr. well, it's certainly is autumn in the NW, cool and cloudy though they are promising afternoon sun. Some days it is hard to believe the sun, and in fact the moon, the stars, halley's comet, the rings of saturn, and the planetary body formerly known as pluto are all up there, past the clouds. today is the artist's reception for my show in Everett at Stuff What I Like. See sidebar for details! If you are in the Seattle Area I hope you can join us. The show will be up until November 13th. Artwork by Adrien Hefta-Gaub, a photo by megan_n_smith_99 on Flickr. Adrien's photos are entirely done on iPhone. She has manipulated her images to create intricate worlds, vivid and glowing with life. You should go see them! Photos do not remotely do them justice. Strata Show opening this weekend! Reminder! My Strata show at Stuff What I Like opens this weekend and is up through November 13th. There will be an artist's reception this Saturday, October 15th, from 4:00 to 7:00pm. 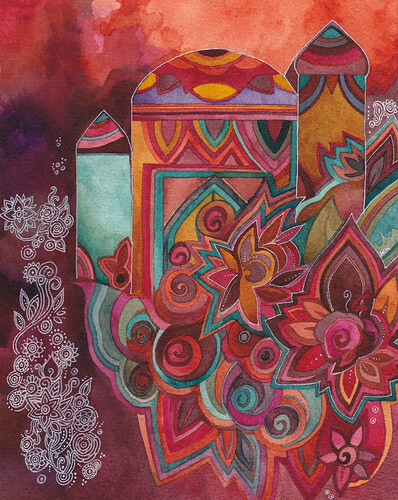 Enjoy some art and sample some indonesian cuisine! Please drop by! Heron, a photo by megan_n_smith_99 on Flickr. Today was a kind of stressful day. Coming home and painting was the best part. Well, first I took a long nap. Obviously I did not paint this all today - I just added a few finishing touches. I think I may do another heron after this one - we'll see if something else is waiting to come into being, but I don't think I could ever get tired of painting birds! Untitled, a photo by Charger's and Frankie's Mommy on Flickr. 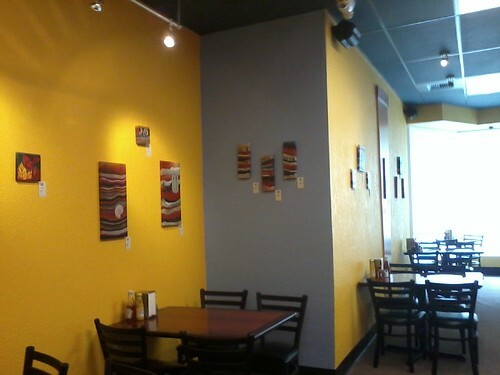 yesterday I hung my Strata Paintings at Stuff What I Like in Everett Washington. Check out their website! The show will be up until November 13th. The opening reception is next Saturday, October 15th. This is a photo Cynthia, the general manager took - I have not gotten mine off my phone yet! And I'll take better pictures at the reception! Busy weekend - getting this work ready to hang and running errands and so on. I did manage to carve out some painting time too. 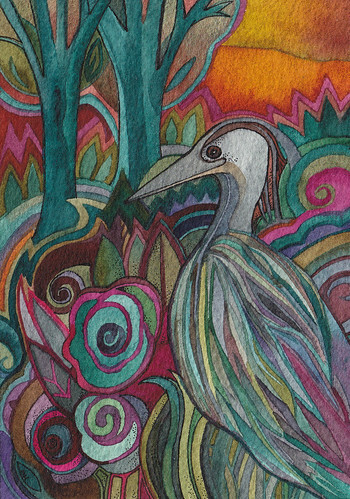 I am working on a watercolor of a heron.. It will probably be done in the next couple days and I'll post a picture. Meanwhile my to-do list is slightly overwhelming but I am trying to pace myself. 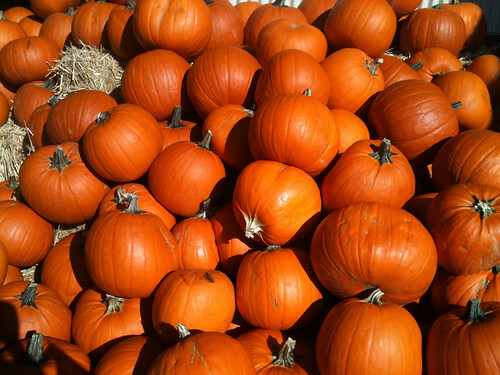 Pumpkins, a photo by megan_n_smith_99 on Flickr. Thanks for everyone who commented on the giveaway last weekend! The winner is Roo! Roo, please email me your mailing address! :) You can find email links to me on my website, megannoel.com. For the rest of you, please check back for the next giveaway, around November 1st! I am getting reading to hang art at Stuff What I Like tomorrow! Otherwise I would be out enjoying the the sun - might not be too much more of it until next year! I had to go pick up some hardware so I took this pumpkin photo at Fred Meyer. Sort of makes me want PIE! The Occupy Seattle protest is centered at Westlake Plaza, near where I am working. This gentleman asked me to take his picture and put it on the internet. I thought he had a point. Sometimes It is the Little things that get you by. I was not feeling very well today. I went and sat outside for a little while on my lunch break, but it was pretty cold and grey. So I went into Westlake Mall and they have this store that just moved upstairs and I had not been in for a few years. It's called Daiso (which is how they translate Dollar Store into Katakana). Anyway almost everything there is $1.50. 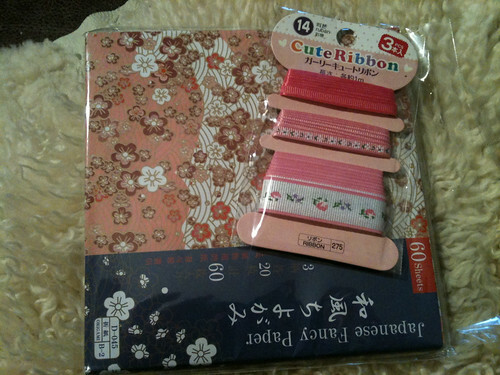 Cute Japanese stuff for $1.50? Sign me up! I got some stocking stuffers and this origami paper and some ribbons for myself. I don't know why I need so many origami boxes but I still feel compelled to make them. Does anyone need some? Seriously! I am also getting better at folding cranes. Everyone I know may get Daiso gifts for Christmas decorated with cranes. They even have bento boxes and rice bowls. I am such a sucker for cute OR just lovely rice bowls, I will be going back soon! Anyway, it brightened my day and distracted me a bit from not feeling well. Do you have any favorite origami projects? DSCF0076, a photo by megan_n_smith_99 on Flickr. This is a picture I took in Taos, New Mexico a couple of years ago. 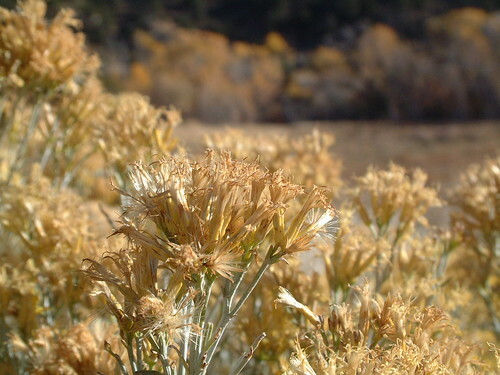 My mother and sister and I went in October and the autumn colors were beautiful - vivid golden asters erupting into a the crisp blue of the sky. I'd love to go back. Happy Thursday! Keep warm and dry. Lunch Break, a photo by megan_n_smith_99 on Flickr. First day on this temp job. It looks like it could last longer than originally forecasted. (Was to be 2 months). The work is in align with my skills. It's not terribly intellectually stimulating but I did not expect it would be. I am sore from standing all day and filing. In a few minutes I will see if I am too tired to paint. I hope not. 1015ac2, a photo by megan_n_smith_99 on Flickr. This is a painting I did a few years ago - pen and ink and watercolor. 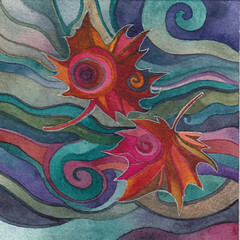 As you know well by now, I love to paint autumn themes and colors. Towards winter I will probably do more bare branches and greys .. Winter in Seattle is not white, but more grey, and at least there is still plenty of green since we have so many evergreen trees! I won't be posting new art as much for a bit since I am starting a temp job tomorrow, But I will be sharing new art as I can and probably posting some "reruns" - things I've done in the past. 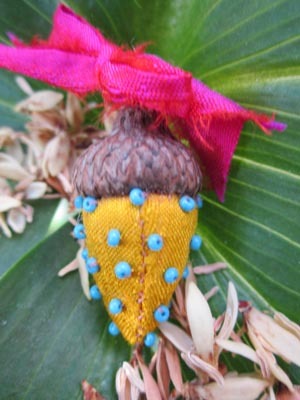 My friend Sabrina has listed some very sweet autumn treasures in her Etsy Shop. I do love acorns. For one thing they are cute, but they are so hopeful. A little package that can grow into a towering tree. A tree that will be a home to squirrels and birds, and will provide shade and shelter. Sabrina has gone a great job of capturing that magic. Otter, a photo by megan_n_smith_99 on Flickr. I had a nice day yesterday. I got some things done around the house and spent the evening with my dear friends celebrating a birthday! 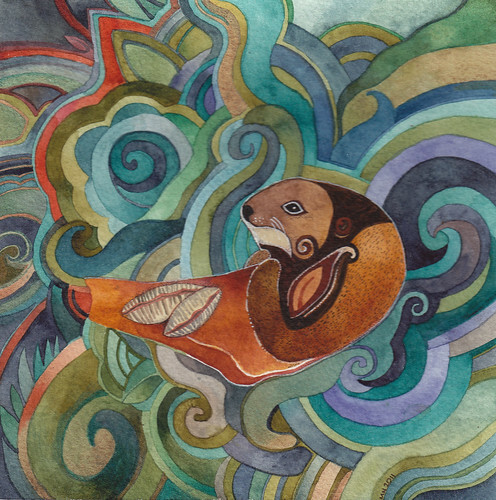 This was the painting I did as a gift - Peter is a fan of playful and fun loving otters! I had a good time painting this. 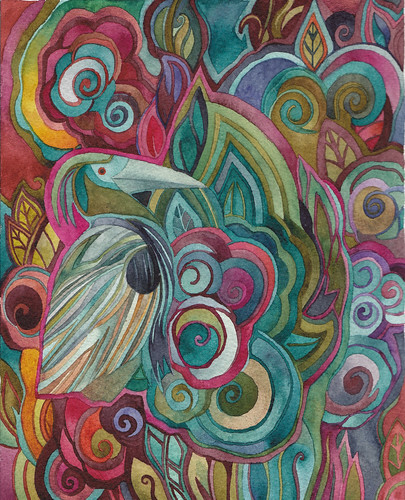 It is 8 x 8 inches, watercolor and ink on paper. Tis the season of hand knits! It was cool enough yesterday that I was able to venture out into the world clad in sweater tights, a wool and silk skirt i had knit, and a hand crocheted cap. i feel my wardrobe really excels in autumn! Churchmouse Yarns and Teas is one of my favorite yarn stores. They bring together 2 of my favorite things! Well, 3, actually, as I am quite fond of mice as well. And they have a wonderful selection of hand-dyed yarn, my favorite. Also a very nice tweed selection. The shop is on Bainbridge Island, in Winslow, a short walk from the ferry terminal. It's so easy to walk on the ferry in downtown seattle. I don't drive but even if I did I'd rather pay the walk-on fare than the car and driver fare! It's a beautiful ferry ride, too. I also recommend visiting Blackbird Bakery, Mora Ice Creamery, and Eagle Harbor books, all within a couple blocks of Churchmouse. Anyway, my NEWS is that Churchmouse has http://www.churchmouseyarns.com/collections/churchmouse-classics-patterns. has released 6 new patterns today, including 2 skirt patterns. I took the skirt class there, taught by Carol Lansinger, and it was the best knitting class I ever took. 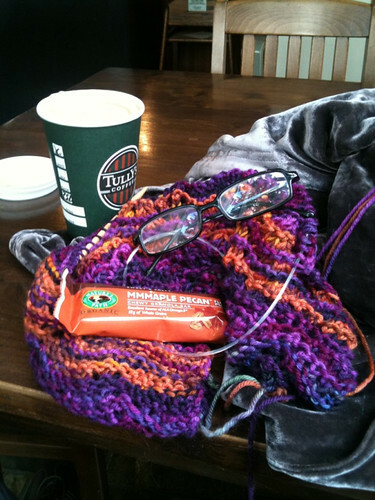 I learned things in it to apply to designing or redesigning any pattern - and yes, I recently finished knitting a skirt. october2011giveaway, a photo by megan_n_smith_99 on Flickr. I am going to try having a give-away once a month. This is the 1st one! Leave a comment here and you will have a chance to win this little creature. I'll randomly select a winner one week from today - Saturday Oct 8th. So leave a comment by then. After I select a winner I will contact you to get your address. 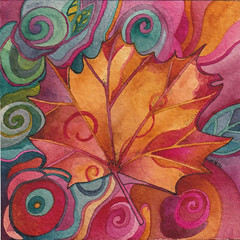 As long as you are commenting, let me know what your favorite thing about autumn is! 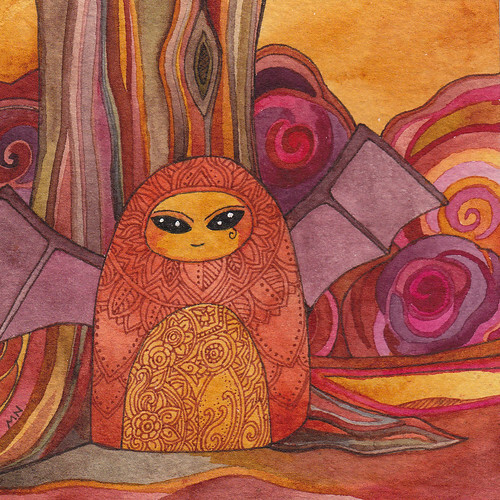 you can also see more autumn creatures in my Etsy Shop.